Throwing down the gauntlet on reproducibility in Climate Science – Forest et al. (2006) | Watts Up With That? I would much appreciate it if you could post a link at WUWT to an article of mine (as attached) that has just been published at Climate Etc. 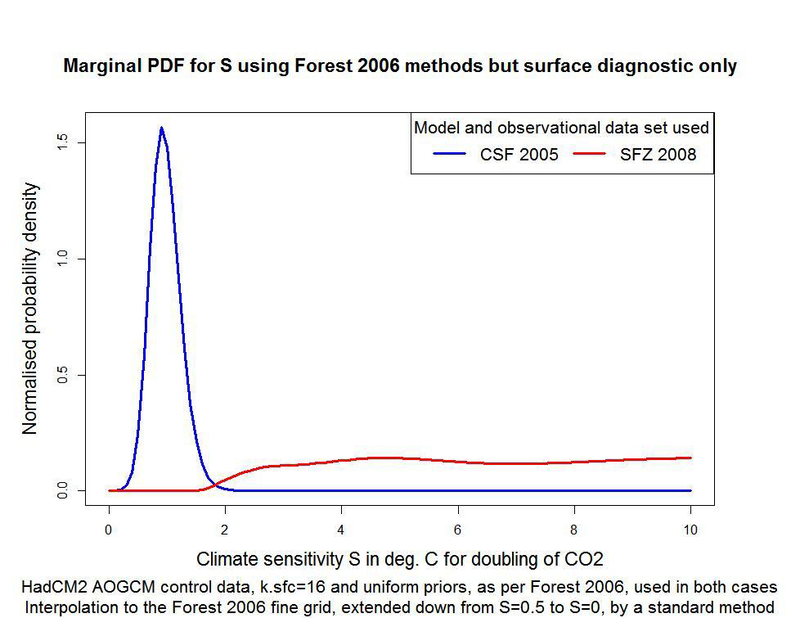 It concerns the alteration of data used in an important climate sensitivity study, Forest 2006, with a radical effect on the resulting climate sensitivity estimated PDF. I’m including the foreword here (bolding mine) and there is a link to the entire letter to the editor of GRL. In the IPCC’s Fourth Assessment Report (AR4), an appendix to WGI Chapter 9, ‘Understanding and attributing climate change’[i], was devoted to these methods, which provided six of the chapter’s eight estimated probability density functions (PDFs) for S inferred from observed changes in climate. Estimates of climate properties derived from those studies have been widely cited and used as an input to other climate science work. The PDFs for S were set out in Figure 9.20 of AR4 WG1, reproduced below. Just let me say that there’s movement afoot to address the issues brought up about reproducibility in journal publications in the last paragraph. I’ll have more on this at a future date. June 25, 2012 in Climate sensitivity, Modeling, Peer review. Tags: climate, climate change, Climate sensitivity, Geophysical Research Letters, Intergovernmental Panel on Climate Change, IPCC, IPCC Fourth Assessment Report, Judith Curry, Watts Up With That? I’ve been doing my best to help this along. This should be brought to the attention of Tom Hammond on the House Science Committee. We had a long discussion about exactly this sort of thing, and since the US government almost always pays or helps pay for the work, it isn’t crazy to insist on it. The Journal of Irreprocible Results was always one of my favorites! Does this mean GRL paper 2005GL023977 should now be considered “grey literature”? Make that Irreproducible. It still exists! You can’t show the data means you don’t have a paper. Worse yet, they average various bogus ‘sensitivites’ to get a ‘likely’ sensitivity. as Keynsian economics is from economic reality. Hehe, looks like the high sensitivity “fat tail” is a phantom. Keep in mind that the scariest climate scenarios are dependent on the “fat tail” for their plausibility, that is, they require a non-negligible probability of sensitivities greater than 4 K per doubling of CO2. I no longer bother to read or try to understand the information published in these journals as you simply can;t believe anything they tell you anymore. I make it a point to tell this to everyone I know and as it is known that I’m always interested in the science end of things , people I know are also doubtful of things science published in the msm. So I do get some revenge on the liers afterall. But it is a sad and bad time for scientific advancement now. … as a last resort – the paper challenged use the inside of the toilet roll! Dr. Forest is obviously a ‘Team’ player! Unfortunately, Dr Forest reports that the raw model data is now lost. Makes me wonder if the “dog ate my homework” excuse worked for Forest in grammar school, or if it now comes down to “…the accumulation of the raw model data is left as an exercise for the reader.”. If I understand the IPCC’s chart, the “lines” at the bottom are meant to be the PDFs collapsed into central estimates with confidence intervals. Notice how the central estimates are pretty much all to the right (higher sensitivity) than the peaks of the PDFs. It seems to me that they may have used inappropriate methods for determining central estimates, given “fat tailed” (ie skewed) distributions. I’d feel for those who used Forest’s work as a key ingredient for their own studies as this pretty much invalidates anything they’ve come up with. But alas they’re likely to be cut from the same cloth of preconcept-dictates-research academics and thus have not added to the body of science with their papers anyway. Once again I don’t get it with the lost data. I am just a poedunk nothin in terms of research and have only a decade’s old master’s level research endeavor archived at Oregon State University plus an article of that research in a major journal. I have no Ph.D. attached to my name, just a bachelor and two masters degrees and my resume does not come with a vitae. Yet I still have my raw data. I have kept it to this day. I still have a drawing of the electrical components used to generate the stimulus I used. I still have a poloroid of the stimulus captured on a spectral analyser. I still have the original typed on a Wang computer masters article that was then copied into the archive volume at OSU. And I no longer practice in that field. Did this guy skip research 101 class? What happens in the academic world if you accuse someone of altering data? I note in passing that Cris Forest is now a colleague of Michael Mann at Penn State. Maybe they can undertake a joint project on data management. The filled circles on the 5-95% ranges (which aren’t true confidence intervals) in the bottom section of the IPCC figure are the medians, which as you say are to the right of the peaks of the PDFs. That is actually to be expected, because errors in estimating changes in forcings and ocean heat uptake greatly exceed errors in temperature data. But almost all the distributions are more skewed than that effect would account for: their tails are indeed too fat. In the case of Forster/Gregory 06, that is because the IPCC changed the distribution onto an incorrect basis. And the very bumpy and other strange shaped distributions are self-evidently flawed. Losing your data is simply the most extreme version of altering your data. Lost- under no circumstances release raw data to anyone not on the team. All they want to do is find something wrong with it. And real science takes another hit from the team. Reproducibility? Every time we run the same model (ie, computer program) with the same starting points and same data, we reproduce the same results. At least climategate didn’t show anyone losing raw data eh! If one of Dr Forests students lost their coursework data would it be a fail? It just amazes me that “scientists” don’t use any source controll programs, try that in any software company nowdays and you would be viewed as a clueless n00b. Phil Jones also seemed to have lost his data so Forster is in good company. A journalist described Hansens office as ‘comically cluttered’ and he was concerned enough to email her saying it was much better than it used to be. It seems the higher up the food chain the more haphazard the treatment of the data. Personally I’m not sure I could rely on a paper produced by someone who tries to work in a ‘comically cluttered’; office. I continue to be amazed that neither the journals nor their peers mandate the release of the data used to support a climate researcher’s or group’s resulting paper. The golden rule of auditing (in any discipline) is that if you don’t write it down, it never happened. In today’s over-hyped Information Age, this presumption that the journal or peer should trust the researcher or group is antiquated to the point of naiveté. I’m reminded what Stephen J. Gould stated in his own (controversial) book “The Mismeasure of Man” says it best, “Phony psychics like Uri Geller have had particular success in bamboozling scientists with ordinary stage magic, because only scientists are arrogant enough to think that they always observe with rigorous and objective scrutiny, and therefore could never be so fooled – while ordinary mortals know perfectly well that good performers can always find a way to trick people.” The same, I think, could be said of some climate scientists. They seemingly and desperately want to believe that humankind is solely responsible for this “catastrophe,” which has been predicted by the models. At day’s end, it’s really rather sad to witness such educated persons failing so publicly, while they remain “eyes wide shut” to the last. Data that have been lost, destroyed, secreted or otherwise unavailable are no different than data that is non-existent. Conclusions based on non-existent data are useless. What a surprise! How utterly original! Phil can’t figure out what he did with the original data. UVA claims they lost the emails, oops, unfortunately (for UVA) they were found. It appears that delete key doesn’t always work. Now the trees (data) can’t be seen and the forest got lost. One does wonder if the data ever really existed. If it did exist, one then wonders if the original data suffered from a reaction to delete key pressing or if it got lost in the recycling (strictly paper bound). The trouble with the data going the recycle route, just what/when was it electronic data so that computer manipulation was possible? I bet those darn backup servers still have copies. I assume that Dr. Forest, et al. will be using their models to predict, make that simulate via a few scenarios, the effect of CO2 levels for AR5. I hope that more robust means of data management will be followed this time around. I can’t imagine Mr. Putin agreeing to modify his countries behavior in regards to CO2 if the scientific experts in his government can’t review the details…….. Calm down everyone, data is right here. Nic Lewis- Is there a reason to prefer the median of these distributions as a “central estimate” to the mode? Well, could be worse, they could have gone with the mean, which would really skew right. You do not lose your data, period! It is impossible to tell when and if or why you want to use them again! Besides, ir feels really good to have a huge stack of data, makes you proud of your efforts. I would feel terrible losing all that work, even if only for sentimenral reasons. I suppose that the median reflects the full distribution to a greater extent than the mode does. But I’m not sure that any ‘central estimate’ is that useful with wide, skewed distributions like these. I prefer to see the full PDF. That has an added advantage: if its shape is peculiar, it warns you to regard the study involved with some suspicion. Don’t be so harsh, people. They lose and forget lots of things at Penn State. Excellent research Mr. Lewis. Clearly you have put an enormous amount of (unpaid) work into this study. We await with interest a response from the GRL editor. The shape of the distributions is not surprising, or suspicious, in and of itself, I think. Sensitivity scales with the feedback factor as 1/(1-f), so if the estimate of f is normally distributed, and the mean is greater than zero, you inevitably get the fat tail for the distribution for estimated sensitivity. But even if we aren’t suspicious, we should check studies to see if the distributions that can be derived from the data really meet the conditions which would lead to a fat tail (mean of estimated f greater than zero is, I think, the crucial condition, or close enough, but it depends on the variance of the estimate of estimates of f) and if they don’t, the fat tail should disappear. Its probably just slipped down the back of the sofa and will turn up soon. Or maybe Forest put it somewhere safe and forgot where it was. After all he’s not expected to be a well-organised and analytical professional scientist or anything is he? Anybody can lose the data associated with the most important paper they’ll ever write. It’s just so forgettable. And you only remember you’ve lost it when somebody asks to see it……. .. assuming for the sake of argument that there is a serious error in the paper: should a paper be withdrawn from a journal, after it has already been heavily cited?.. I agree that a fat tail distribution is to be expected. I don’t regard a fat tail in itself as a peculiarity, but I do regard multiple peaks and strange bumps and shoulders in the PDF as being peculiar. Only one of the distributions in the IPCC figure, Gregory 02, is genuinely consistent with a normally distributed estimate of f – and the Gregory 02 is missing nearly half of its probability mass, due to being cut off at f=1. 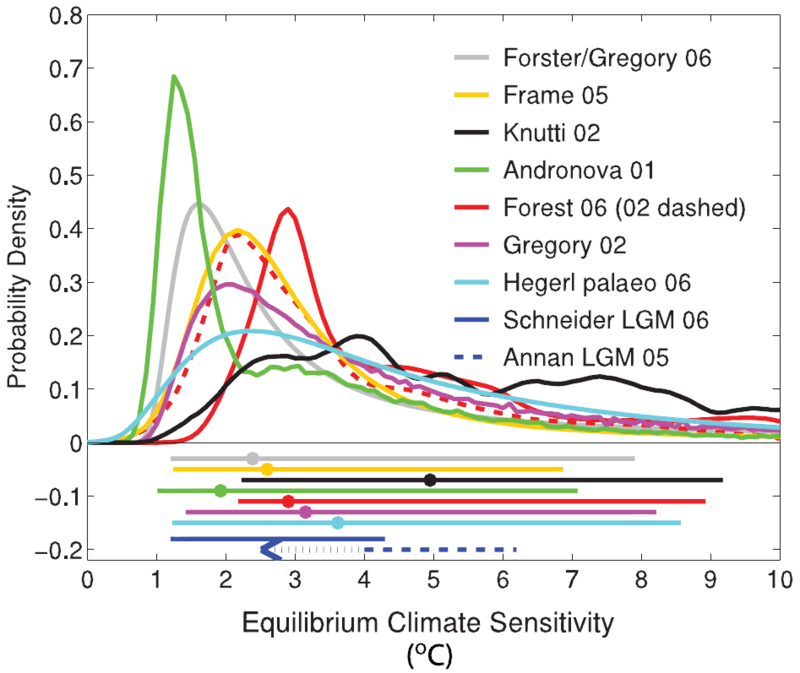 The Forster/Gregory 06 PDF represents a normally distributed estimate for f, but the IPCC experts decided to multiply the resulting climate sensitivity PDF by sensitivity squared – supposedly to make it comaprable to the other PDFs! Is it worth trying his co authors Messrs Stone and Sokolov surely they must have a copy of the data? I work with volumes of clinical research data all the time. In the course of a research project I might have several subsets of the original data as queries of the original data produce output that looks at how the experimental variable(s) affect different stratifications of the sample group. Each dataset must be properly validated, versioned, systematically stored according to “best practices.” Further, all data is mirrored and stored in two data centers and warehoused with a data vault company. Such data is considered so precious that such controls are an absolute requirement. Anyone who outright looses the original data has such bad organization and lack of controls in place that any results of their work must be called into question. I continue to be astounded at the shoddy research practices of these climatologists and even more astounded that their work is not thrown in the waste bin by the publishing journal when such gross negligence is discovered. Dr. Forest is now with the Department of Meteorology at the Pennsylvania State University. Before that, he was with MIT, his thesis advisors were Kerry A. Emanuel and Peter Molnar. I have tried. I understand Dr Stone was seriously ill when I emailed last year, so I have let him be, poor chap. I have failed to obtain any response from Dr Sokolov, who is the expert on the MIT 2D climate model. Maybe he thinks that it is entirely Dr Forest’s responsibility to respond, or perhaps he doesn’t like a non-academic poking his nose in. Nic Lewis-Yes, you are correct, I should have said I don’t regard the fat tail itself as suspicious, but like you I do find the odd shoulders or extra local maxima (secondary “modes”) as curious and suspicious. In this regard the worst offender appears to be “Knutti 02” which gives the most outrageous estimate for sensitivity of all of them, surely! I suspect the dogs paw accidentally hit the delete button on the co authors computer. Once again I don’t get it with the lost data….. I am with Pamela on this. I did not even do a Master’s thesis only a couple of Senior Year Topics papers, one in geology and one in Chemistry. I still have all the information and even gave a copy of the Geo research to a geologist who asked me for the information at a National Speleological Convention of all places. If you can not come up with the raw data and have it validated and verified by others it is not science PERIOD! Think cold fusion and the more recent CERN finds faster than light particles? and the update CERN researchers find flaw in faster-than-light measurement. I wonder if it would be reasonable to try and reproduce the top 15 climate paper, in terms of cites? surely this should be a sticky top post? Indeed – not a very useful estimate of sensitivity IMO, since it reflects and unweighted average of 5 different ocean models, and uses a weak yes/no rejection test for the simulation-observation mismatch. The Knutti paper didn’t actually include either a sensitivity PDF or any distribution from which one could be calculated, except for a 5 bar histogram (2 K per bar) in the SI. I presume that the IPCC ran this through some sort of smoothing algorithm. Silly old me thinking science was about reproducability from the data. Now if you can’t get the data then it’s not science in my opinion. Here is the great irony of the “Lost Data”/Rcord Keeping mystery. It seems that while CRU/IPCC scientists can get away with “The dog ate my home work” The United Nations (OIE) 2005 Draft Guide To Good Farming Practices wanted to hold farmers around the world to much higher standards. place all these documents and records at the disposal of the competent authority (Veterinary Services) when it conducts farm visits. If the UN expects FARMERS to keep and have available those type of very specific records, how come PhD scientists are not held to the same standard as a lowly farmer? Especially when the scientist will have a much larger effect than any one farmer – Double Standards anyone? In light of the above UN document, the “dog ate my homework” excuse can not be justified. The IPCC should be throwing out ALL scientific work that is not as precisely documented as the UN was demanding of farmers who are NOT even receiving public research grants to cover the costs. Indeed – not a very useful estimate of sensitivity IMO, since it reflects and unweighted average of 5 different ocean models, and uses a weak yes/no rejection test for the simulation-observation mismatch. Such papers obviously do not harm an author’s career in this branch of science. Co-author Thomas A Stocker is now co-chair of the coming IPCC report. Lost the data? Good enough for “climate science”. Don’t blame Dr Forest. I’m sure he had funds set aside to pay a grad student to do some filing, but his boss insisted that the money be spent instead on a junket to an exotic location a well earned holiday a boring conference in some godforsaken third world hellhole. Can’t prove scientific fraud if the data is lost. Is simply means that Forest et al. (2006) is scientific nonsense. It cannot be reproduced, even by the author. It has the same value as used toilet paper. It is paper, but it is covered in crap. No replicability ☰ No science. The paper must be withdrawn, invalidating all references to it. 1. find a major unanswered question. 4. re-label this technique “training” – it makes it sound intelligent. The results will seem correct to fellow scientists, especially those at the top, so they wont bother to check the math. Everyone will be impressed you have answered the hard question. More so because you will have proven their best guess correct and made them look good in the process. You will advance in your career in science. Fame and fortune will follow. Lucy, should a mineral discovery be withdrawn from a prospectus after it had been found that the assays were badly wrong, or lost, or both?” People can go to prison for this. Is it not self-evident that there should be an active, continuing process of demotion into separate storage of unacceptable papers and correction of acceptable papers when, for example, better data become available, like new temperature series used in proxy calibration? Although Science is seldom expressed in absolutes, should not there be a classification like G for general exhibition, M+ for mature audiences, R for dubious and X for fail? Why, there could even be a ratings journal that logs papers and shows event that overtake them. Have addendum, corregidum, erratum, etc been wiped from the repertoires of authors? There is evidence for a quite bad structural/organisational failure in the halls of academia when the emphasis is on floating new ideas, with an almost 100% failure to wipe the slate clean of the baddies. As noted ad nauseum, much of this starts with the gross and frequent failure of peer review. Yesterday, out of interest, I googled ‘Dr C E Forest PSU’ to find out more about the man. Unless I am mistaken, no such paper now exists in his bio of ‘Selected Publications’, which bearing in mind it’s obvious importance seems a little odd to say the least. Congratulations on your endeavour and clearly sustained work focus. Thank you also for the article and subsequent explanations. Most interesting, I am still working my way through reading this post. However. I still have a problem understanding the term (and focus) on sensitivity. I was taught about sensitivity and specificity. Type I & II errors. I do not understand why there continues to be a focus on sensitivity when, to my understanding, the question should be on the specificity. .. an incorrectly formulated hypothesis. Would you have an explanation to this question please? Thank you for responding here. While most commenters are most concerned about the the fact the data is “lost” and the code withheld, I am more interested in the policy implications of a possible reduction in the climate sensitivity (central estimate and ‘fat tail’). Therefore, could you please advise what has happened in response to your finding, reported on Judith Curry’s site in July 2006, that the IPCC AR4 had replotted (apparently incorrectly and without fully explaining why) the climate sensitivty results of Forster and Gregory (2006)? For the benefit of other readers I’ll provide some more background, links and more questions below. In July 2011, you suggested that IPCC had wrongly replotted the Forster/Gregory06 paper http://judithcurry.com/2011/07/05/the-ipccs-alteration-of-forster-gregorys-model-independent-climate-sensitivity-results/ . IPCC’s replot moved the median climate sensitivity from about 1.6C to 2.3C and gave a much fatter tail. The IPCC curve is skewed substantially to higher climate sensitivities and has a much fatter tail than the original results curve. … and the central (median) estimate is increased from 1.6°C to 2.3°C. In the case of Forster/Gregory 06, that is because the IPCC changed the distribution onto an incorrect basis. And the very bumpy and other strange shaped distributions are self-evidently flawed. Is that generally accepted? (this is an innocent question; I have no idea what has happened since with that). Does your comment mean that it is now generally accepted that the IPCC replot of Forster/Gregory06 was wrong? Does this mean that the now accepted interpretation of that paper is that it suggests the median climate sensitivity is 1.6C? What have the autjhors, IPCC and the journal that published the paper said and done? Could you please elaborate (for a non specialist) on the significance of this. Hm, correct me if I am wrong, but doesn’t much of the work that finds that eventually their could be net economic harm from AGW depend crucially on the PDF of climate sensitivity-and require the fat tails for their conclusions? Such studies already find that the “ideal” policy is very close to doing nothing, even under the assumption of many negative “impacts” which, frankly, do not exist. So without the fat tail, Nordhaus can kiss his Carbon Tax (already small) goodbye, no? So without the fat tail, Nordhaus can kiss his Carbon Tax (already small) goodbye, no? I hate acknowledging my ignorance, but honesty compels me to. I can’t make head nor tail of these graphs. What are the abbreviations, why do they have the axes they do, what do you think they prove and why do you think so? I’ve an IQ that’s acceptable, a physics and chemistry education to year 10, Advanced Math for year 11, some statistics at tertiary level, a lifetime science enthusiasm including most of Sagan, Asimov, Gould et al’s popularised science- in short, I’m vastly better educated than the average member of the population(*)- and I still have no clear conception of what these graphs are supposed to prove or why you think they do so. My point being that if I can’t follow them, neither can many others of your readers. Can the OP or commentators please help me? …..Is it not self-evident that there should be an active, continuing process of demotion into separate storage of unacceptable papers and correction of acceptable papers when, for example, better data become available, like new temperature series used in proxy calibration? Although Science is seldom expressed in absolutes, should not there be a classification like G for general exhibition, M+ for mature audiences, R for dubious and X for fail? Why, there could even be a ratings journal that logs papers and shows event that overtake them….. The social psychology community, already rocked last year by the Diederik Stapel scandal, now has another set of allegations to dissect. Dirk Smeesters, a professor of consumer behavior and society at the Rotterdam School of Management, part of Erasmus University, has resigned amid serious questions about his work. WOW, could not produce the raw data… cherry-picked the data…. statistically highly unlikely…. GEE where have we heard that before? Other branches of science are starting to clean up their act, isn’t it about time Climatology was held to the same classic science standard? The last thing in the world that the 100+ scientists that have used F& al in their citation will want is for the paper to be withdrawn. This would call into question their own papers. They have a very strong vested interest is supporting F & al regardless of quality. Would it not also make sense to file a FOIA request for the raw data, etc. to the granting agencies and academic institutions involved? Climate sensitivity is defined as the rise in global temperature resulting from a doubling of carbon dioxide concentration in the atmosphere, after the climate system reaches a new equilibrium, with other external factors being held constant, roughly speaking. Remember that the leaps in theoretical physics by Einstein were accompanied quite passionately by the call to verify them with empirical testing. Today the method is hide, profit, and move on before anyone bothers to check. But then who would want to check if the consequences amount to professional tire slashings from the new blacklist enforcers of the climate change ecosystem? This discussion is fascinating. It seems the estimates of climate sensitivity may be coming down (but that may be my bias). He has said he will get back later with more responses to Nic’s follow up questions and others. This gives information on other work that suggests climate sensitivity may be significantly lower than the IPCC AR4 consensus estimate. This is about what progress has been made regarding his paper of a year ago which pointed out that the IPCC had replotted the Forster and Gregory (2006) to make the climate sensitivity much higher and the tail of high consequence much thicker (see figure 4 here: http://judithcurry.com/2011/07/05/the-ipccs-alteration-of-forster-gregorys-model-independent-climate-sensitivity-results/ ). It seems to me there is strong and growing evidence that the damages are not potentially catastrophic, not dangerous, and not high cost. Therefore, adaptation is the best strategy, IMO. Based on the MODTRAN utility provided by the University of Chicago, the *raw* sensitivity (no feedback) for CO2 is about 0.9 deg K per doubling in clear tropical air with a nominal energy flow of 292.993 W/m² (picked from one of the standard program output values) at current CO2 concentrations. I understand MODTRAN to be a program developed by the Air Force for instrumentation calibration, and is a computer calculation based on the measured line-by-line absorbance parameters for the gases in the atmosphere. The surface temperatures were found by a hunt-and-pick process for each CO2 level to achieve the standard energy flow number at 70 km up. I understand that this web-tool is hosted courtesy of Dr. David Archer, a non-skeptic. Another example of the minimal forcing change with a doubling (300:600 PPM) of CO2 is provided by a plot from the Wikipedia article on “Radiative Forcing.” The blue curve for 600 PPM CO2 almost completely covers the green curve for 300 PPM. It is my understanding that the higher values posited by the IPCC are based on an assumed, dangerously high, positive feedback factor. Although interactions with the water-vapor absorption spectra are sometimes said to be to said to be the cause of this, I see no water-vapor holes in the forcing spectrum. Perhaps convection makes water-vapor a leaky greenhouse gas. It is interesting to note that a MODTRAN analysis of radiative transfer by altitude seems to indicate that most of the energy leaving the Earth is actually radiated directly from the atmosphere–specifically the troposphere. Most of the energy radiated directly from the surface (396 W/m²) is returned by back-radiation (333 W/m².) That is clearly shown in the standard IPCC heat transfer diagram. Had a paper written up for, GRL I think it was that made the point, partially based on this fact, that the TOA flux changes are poorly correlated in with the surface temperature variations in part because the bulk of the radiating energy comes from the atmosphere and is thus determined by the atmospheric temperatures-also that clouds don’t magically know what the sea surface is doing instantaneously, they react to the temperatures of their ambient environment, which lags the sea surface temperatures, in terms of anomalies, significantly. We found that if you use atmospheric temps (say UAH or RSS LT) the strength of the correlations improves and you should get a better estimate of climate feedback, and lower sensitivity, as it happened. Sadly the journal rejected our paper, even though our sensitivity estimate was not that low. I thought it was biased high, personally. Further, all data is mirrored and stored in two data centers and warehoused with a data vault company. Such data is considered so precious that such controls are an absolute requirement. Anyone who outright looses [loses] the original data has such bad organization and lack of controls in place that any results of their work must be called into question. I continue to be astounded at the shoddy research practices of these climatologists and even more astounded that their work is not thrown in the waste bin by the publishing journal when such gross negligence is discovered. The pattern of brazen disregard for standards and even strict legal requirements seems to be a core strategy and tactic of the B3 crowd (B.S. Baffles Brains.) See the US Administration for a close parallel.